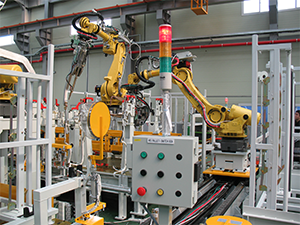 Industrial robotic systems offer a new benchmark in flexibility, safety, reliability, quality and throughput. Element Machinery specializes in tailoring robotic automation solutions to fit your process needs. We have the capability to integrate multiple robotic manufacturing platforms. Whether its installing a new robotic actuator into a process or re-purposing existing robots, Element can help. Element has experience combining robotic systems into multiple automation platforms ensuring a seamless transition of production to a robot cell with work in process tracking and interlocks. Some major benefits of robotic automation are in productivity, safety and savings. Robots save time by being able to produce greater magnitude of end product while reducing wasted material due to inaccuracies. Robot cells increase safety by removing operators from hazardous operating conditions, alleviate the need for operators to perform risky tasks and remove the need for repetitive tasks that can have long term effects on an operators body. The increased productivity of robots is realized in more accurate and high quality work at a higher rate due to speeds and lack of time off necessary. A single robot can perform a wider amount of challenging tasks than a single operator could without the chance of injury. 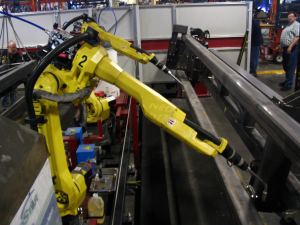 Element can design, manufacture, and service End-of-Arm-Tooling (EOAT) for all styles of industrial robots. We are also capable of developing and supplying interchangeable EOAT designs to allow your robot to service a wider range of products. We have a broad range of experience across a number of manufacturing sectors including metals processing, paper/cardboard, plastics, palletizing, and food/pharmaceutical. Integration of work assist robots into Element’s assembly stations offers an extreme flexibility to the assembly station process. This provides an assembly process that can position the work in process in any orientation for the operator to perform assembly all while maintaining safety torque and force limits to eliminate possibility for operator injury.